Alan fell in love with the banjo and the playing of Barney Mckenna. 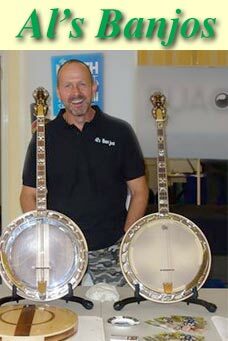 He offers a repair service and produces handcrafted banjos using solid hardwood (no veneers). There are always examples available for you to try out in his workshop but you can choose your own custom build from the type of hardwood, skin, ring, action and if you want pearl inlays etc. It's your banjo so it's your choice. Check out Al's Banjos website for more information on Al's Banjos.